A Bible Garden is one of the most peaceful places in the world. It makes you feel like you are at one with God. When you read the Bible, you think about all the wonderful plants they had in those gardens. 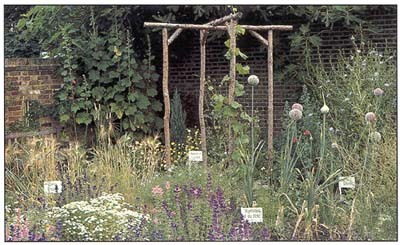 The garden is just not only for looks but also for eating and surviving. Some of the plants in the landscape are perennials and some are annuals. Some have beautiful leaves, flowers, and shapes. Others just have a good fruit. Each plant can be found in the Bible with it’s own verse and with its own special meaning. Genesis reports that ‘God said, "Let the earth put forth vegetation: plants yielding seeds, and fruit of every kind on earth that bear fruit with the seed in it"’ (1:11). Another book might describe a Bible Garden as a production unit of fruit trees, herbs, and vegetables rather than a display unit for the beauty of flowers. Some biblical cities were just awesome such as the City of Palms. This city was lined with Date Palms. When approaching the city, you could see the palms and then know where to walk. Most of the time these palms were filled with great coconuts. The temples always had probably the best landscapes because the people felt like they needed to have something that showed God that they believed in Him. One way was to have an interesting place to come and worship to Him. The plants grew locally and were easy to transplant or get seeds from them to grow for themselves. When researching Bible Gardens, you must find a good source. The prophets’ knowledge was limited because they were not biologists.